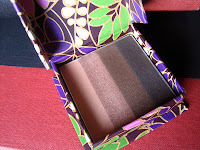 1) Tarte Beauty & the Box Amazonian Clay Eye Shadow Box in Brewed Awakening - Are you ecstatic or wearied to find me with yet another Beauty and the Beast reference? The fact of it is, I was looking for brown eye shadows. The big palette that came with my holiday set has plenty of colors, but no browns. Since I have brown eyes and hair, brown shadow is a basic for me. This set has four shades; the second lightest is gloriously warm and the darkest is only barely dark brown. Just what I was looking for, plus a pretty box. 2) Sherlock Holmes books - A thrift store find, these two volumes are possibly from 1930. In any case, they add a nice touch to my piles of books. 3) Tarte Skinny SmolderEYES Amazonian Clay Waterproof Liner in Onyx - I use a pencil liner below my eye, a liquid one on top. It took me forever to switch to Tarte for the pencil. Now that I have, I'm impressed: this is long-lasting and very dark. If your eyes are at all light or you want a softer look, go with a different shade. My eyes, though, are quite dark, so I'm fine with the color. 4) The E Ticket magazines - Oh, Disney. I found a pile of these at an antique store. Though I wish I could have gotten all of them, I was happy enough to get two. They're only about my age right now, but already they're a little bit of history that's only going to get cooler with time. 5) Tarte EmphasEYES For Brows High Definition Eyebrow Pencil - I ogled this pencil for a while, then let myself get it last month for graduation. It really helps fix minor "errors" in your brow shape. 6) Stone Dinosaur - This one's another little gift from Santa Fe, knowing my fondness for dinosaurs. It hangs around by my jewelry these days. 7) Metal Bracelet - These next three are thrift store finds. The bracelet has a girly pattern reminiscent of Lothlorien. 8) Metal Ring - I'm crazy, I know, but I like this kind of ring. It's twisty and simple and good and tarnished. 9) Fossil Pendant - Ha, ha. Ha, ha. It looks like someone made this especially for me. I'm wearing it today. 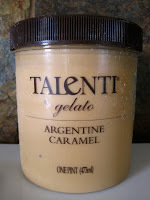 10) Talenti Argentine Caramel Gelato - Ice cream isn't my favorite, but this, this is amazing. 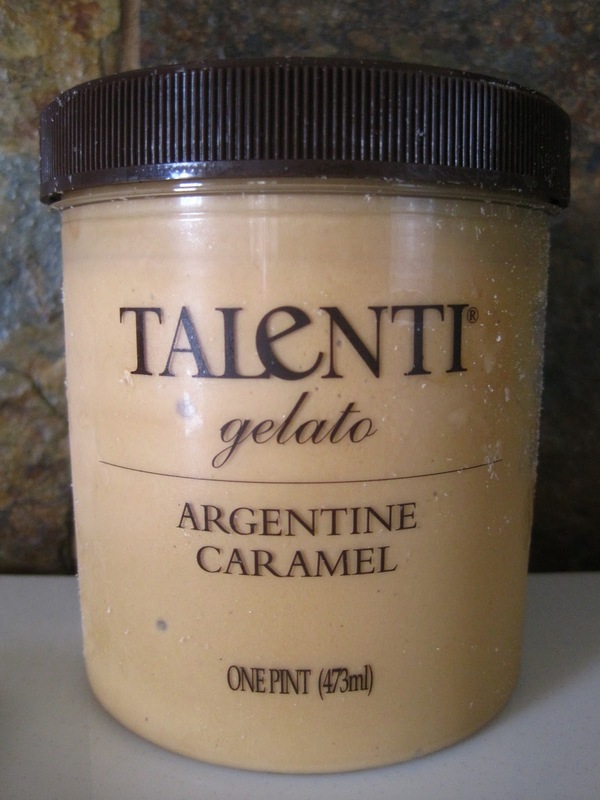 It's smooth and creamy (because it's gelato, right?) and tastes just like fresh, soft caramel. An elegant summer dessert. It's only my fourth graphic novel, right? (Not counting The Invention of Hugo Cabret.) The others were the two volumes for Twilight and Jane Eyre. What Young Kim did with Stephenie Meyer's text in the those first two volumes pleased me; simply put, Volume 1 of New Moon does the same. I read the first few pages casually, then set the book down for a day or two, not feeling much need to hurry back to it. But when I did, I found myself sitting with it until I'd finished. It's of course quick to flip through, being a graphic novel. But it wasn't the book's speed that made me finish: it was a repeat of that feeling I'd had before. It was a refresher of what made me like this story to begin with. While dialogue is shortened, there are still enough of my favorite quotes and scenes to re-immerse myself in this world, while also introducing a new format. Correct me if I'm wrong, but I believe there was less color in this book; I can't double check because I don't have the others with me at the moment. Yet there were still a couple of scenes that stood out, artistry-wise: Bella's dreams and the scene with Laurent. I'll be getting Volume 2 when it comes out. Chocolate two of three of my gifts from Santa Fe is not, in fact, from Santa Fe. I suspected as much, but did not expect John Kelly Chocolates to originate in Hollywood. It's tempting now to turn picky and say that for Hollywood, this chocolate should be better. Instead, however, let's leave company origin aside for the moment. Like a bar of gold, this Truffle Fudge Bar comes wrapped in gold. It's a yellow gold that gives it a more casual gold look. The simple sticker implies handmade, small scale. My fudge is the Dark Chocolate without Nuts. Is it posh or homespun? More like a truffle or more like fudge ? Truffles and fudge are both delightful, it's true. The 57 gram bar is like a thick slab of fudge coated in a reasonable layer of chocolate. It looks small, but bite into it and you'll find enough richness to last a while. The texture is somewhere between coarseness and smoothness, like homemade fudge. Yet the flavors are bolder. Red cocoa notes melt out like a flash flood in the dessert. Embracing, consuming like a truffle, but familiar and approachable like fudge. If you're a steadfast milk chocolate person, maybe you will feel differently. I, however, did not find this truffle fudge very dark; it was at a comfortable in-between level. Very pleasant would be an accurate description. Why, then, my comments about pickiness? For fudge, it's heavenly. But for a high end product, it passes. The packaging is fine, but not couture. And the taste is rich, but not snobbily luxurious. I detect palm kernel oil and corn syrup hiding within the ingredients list. For something with a $3.95 price tag, the details matter. Nibbling away at this rectangle of truffle fudge is proving to be my latest hobby, but I'll still turn elsewhere when seeking, foremost, a chocolate experience. Last week, I took Connor and Abby to the beach--in California, of course. 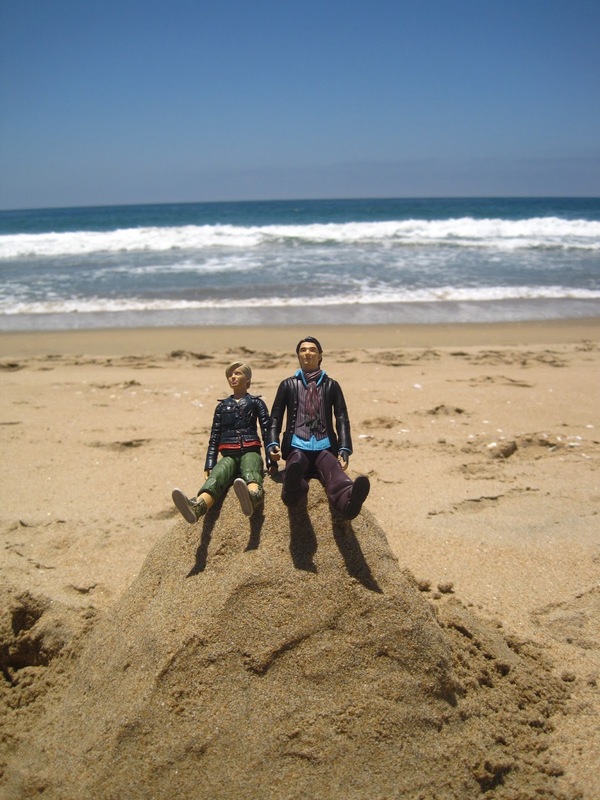 They hung out on a sand castle/mountain, trying not to get too sandy. Minus several seagulls, a dose of ducks, piles of tiny crabs, and a critter hiding in a pointy shell, there were no creatures to be found. It was vacation for the ARC team. "Alright, so I'm going to be in the L.A. area. Type that into Google. Hmm. That chocolate shop doesn't look very good; that one just looks like a lot of hype. That one looks okay, but their website doesn't excite me. What's this? Valerie Confections? What? Rose Petal Petits Fours? I must have those." Their original boutique is in Silverlake, not too far from downtown L.A. It's a small shop, with a glass case of petits fours next to a shelf of preserves, which are in turn across from shelves of boxed chocolates. When we stepped in, the shopkeeper offered us freshly made Smoke & Spice Truffles. These happened to be some of the ones I singled out online; I was thrilled. The cocoa powder makes them look like they would be soft ganaches, but there is still an outer layer of chocolate. They aren't nearly as spicy as many spiced chocolates these days, of which I was glad. The flavor is used within the chocolate rather than thrown in as a novelty. We picked out a box of Mint Mendiants for a gift, which have already received positive commendations. They come topped with a candied mint leaf. The six chocolates we picked out (two each) we didn't get in a gift box; perhaps we imagined we would eat them more quickly. But being that these are petits fours rather than little truffles, they tend toward slower eating. My in-the-car pictures hardly do them justice, but they're visually gorgeous. The chocolate is smooth, and the garnishes have all the more impact because the look is kept simple. Lemon, Mint, Orange, one I'm not sure of, and my own two: Rose Petal and Champagne. The Rose Petal Petit Four brings me to a Victorian tea house, with flowers and fine dishes and ladies wearing feathered hats and lace gloves. The candied rose petal is delicate and the white chocolate base substantial. It felt so strange to be so drawn to a white chocolate, but from the first picture I saw of this chocolate (or should I say dessert? ), I was in love. And then I bit in and felt all the ingredients coming together, the softness and the lightness, the crispness and the sweetness, and I fell more in love. The composition is four layers of vanilla bean cake, with rose petal ganache in between. A box of these would be a better gift from a gentleman to a lady than any bouquet of roses. The little Champagne Petit Four got left behind and carried around all the way home. Not the best conditions for it, yet it managed to arrive looking decent. It begged me for a photoshoot of its own. A gold flake glints on the top. This one uses butter cake with the champagne ganache, making it look more like a mini cake than the Rose Petal one did. Maybe it was because this one wasn't new by the time I had it, but I prefer the Rose Petal; it had a more complex and crafted flavor. This isn't, of course, to say that the Champagne wasn't well made. I sliced it into triangles as if it were a cake and it disappeared in errant thoughts of richness. I didn't go for the chocolates or for the straight out desserts at Valerie Confections, but through the petits fours I discovered how complex and gourmet a "confection" can in fact be. It needn't be trite or childish or nostalgic; it needn't neglect quality ingredients or precision. Would I go back to Valerie Confections? Instantly. Instantly. There's something about the Sarah, Plain and Tall movie trilogy that gives off a positive feeling. It's a prairie story filled with heart in a subtle way. 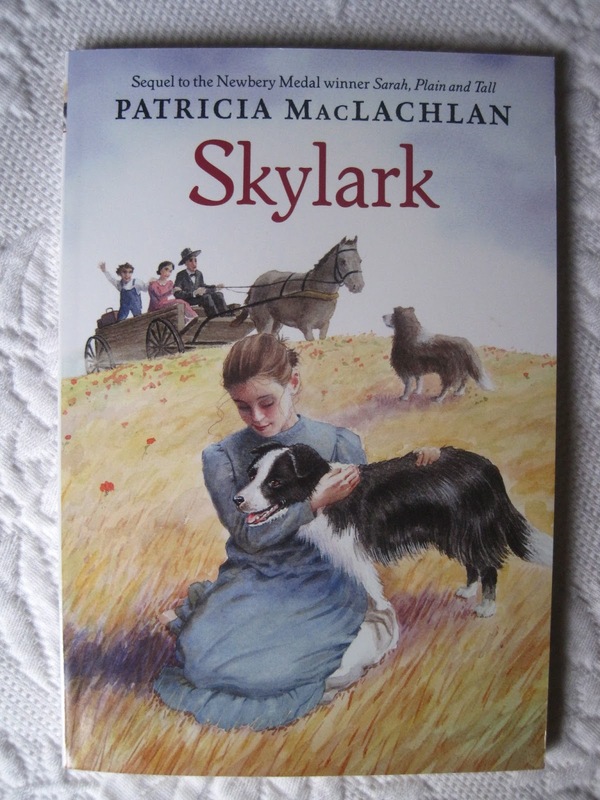 Although I considered it, I never got around to reading the books by Patricia MacLachlan, likely because even by the time I was watching the movies I was already above the books' age group. But as we readers all know, age group shouldn't matter--not when a book is good. The first book is a mere sixty pages, the second and third ones each a little longer. I somehow, however, ended up spreading out the reading of the first book over the longest period of time, whereas I finished the last book within one day. So they are short enough to be friendly for younger readers. But there's a quote in the second book, Skylark, that also made it into the movie that I find applies well to how these books are written. It's the quote about when Sarah read Jacob's letters and fell in love with what was between the lines. That's how these books are: plain and simple, yet vastly poetic and heartfelt words. The basic premise is a family whose mother died when the son was born. About six years later, the father puts an add in the paper for a wife; Sarah comes from Maine to their farm. The time period is what, 30 or 40 years after Little House on the Prairie? So it's a prairie story, but slightly more modern and less focused on describing the setting. It's more about the characters. The first book maintains a very simple and sweet plot. I enjoyed the second one most. The pull between lands, the dry prairie and green Maine, creates a poignant personal and cultural conflict. As someone living in a harsh landscape that I have also come to love, this was something I could really relate to. It's also a theme that develops any time a person finds a new home. 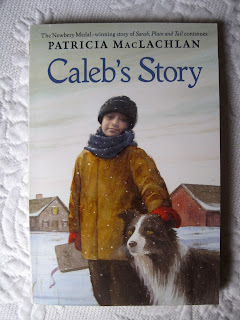 Caleb's Story, which in the movie version is called Winter's End, moves the perspective from Anna to Caleb. Like the other two books, it's much like the movie, minus certain details. The movies fleshed out conversations and such, especially between Sarah and Jacob. 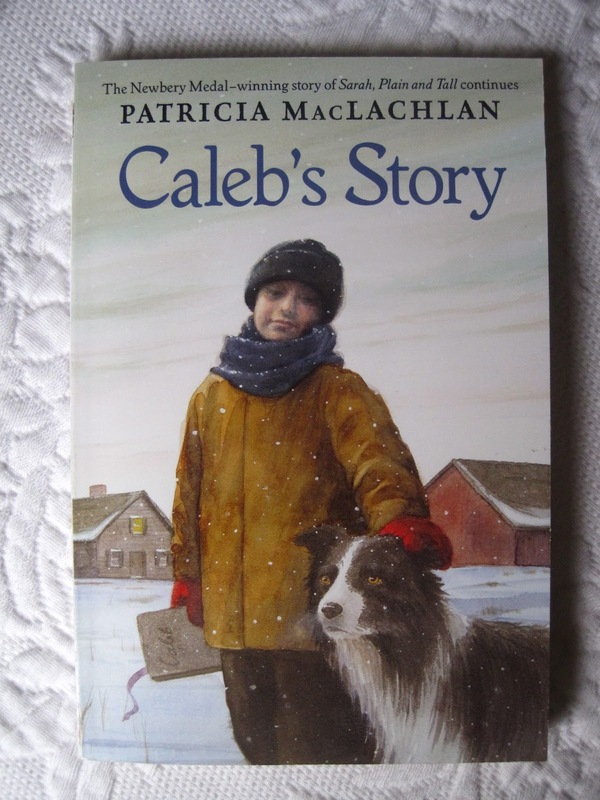 In this story, the focus moves back to storytelling, words, and creation; as Caleb takes over keeping the family records, he discovers what these mean. And so does the reader. These books are refreshing. Nothing is overdone, everything matters, and you're left with a feeling of contentment--whether you're in elementary school or long out of school. I currently have three little, chocolate-goodness presents from Santa Fe. Santa Fe's chocolate scene isn't too bad--certainly I find it better than Arizona's. This includes companies based in Santa Fe, in addition to the chocolates that are available to purchase there. The first item is a $2, silver-wrapped chocolate fig. The Rabitos Royale figs are made by a company called Productos la Higuera that began in 1989 in Spain. The figs were their first product; now they also have a version that includes orange. In addition to crisp photography on the company website, there is also a model of their figs. 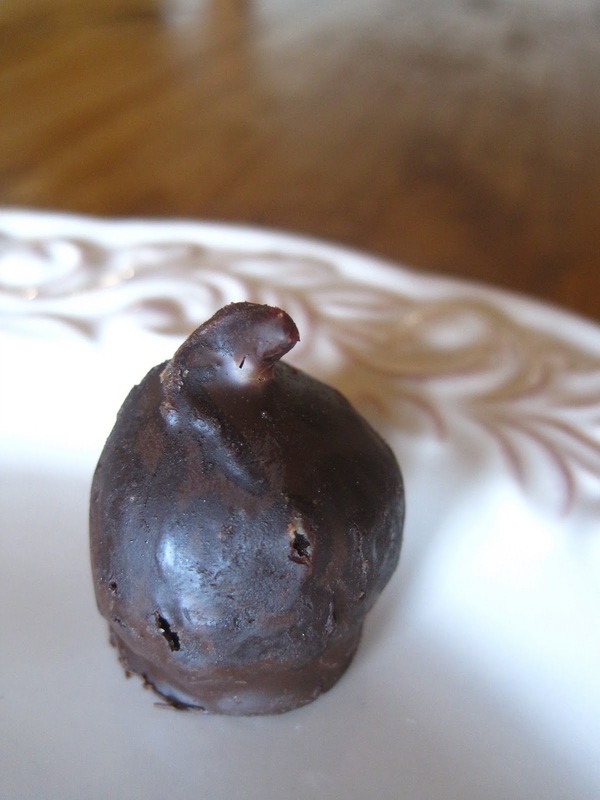 The dried, mediterranean figs are filled with "truffle liquor cream" and covered in chocolate. That's right, there's brandy involved, as is quite apparent when opening up the little package. Since my fig had to travel a few extra miles to get to me, it wasn't the prettiest on the outside. The inside, however, looks better. A ring of fig seeds snuggles next to the chocolate coating, with lush truffle cream in the center. When you bite in, the fig portion is chewy against your teeth and the seeds crackle softly. The chocolate melts and the truffle center spread its flavor breathlessly. A diverse, yet non-shocking, combination of textures within a small space. Although the brandy scent was strong inside the packet, the flavor isn't. This isn't a boozy truffle, nor is alcohol the strongest flavor. I would put it second to both the fig and the chocolate. Probably the fig comes in first, if only because its texture begs extra attention. I feel like Americans only eat figs in Fig Newtons--am I wrong? If you come across a Rabitos Royale fig, try it instead for a little luxury. And if you think of it as a truffle (a largish one, too), $1.95 isn't steep in comparison to other truffle prices. Maybe buy a few, set them up as a dessert plate with some cheese. Sit over the table, letting the chocolate slowly melt with the shape of the conversation. Or bring them outside to match the warmth of the cocoa to the red of the sunset. Let the seeds match the stars cropping up in the sky, and close your eyes. At last, at last, Primeval: New World, the Canadian spin-off of the British series, has debuted in the U.S. The niche of Primeval fans here (yes, there are some of us) is ecstatic--we were absolutely jealous of all the other countries that got the show so many months earlier. Which, naturally, meant that some of us have in fact already seen the show--but we will be good and watch it on TV, too. I don't usually do that; in this case, I just couldn't wait. Right away, it's very odd not to hear British accents. The Primeval-verse without British accents? What, is that even possible? So you have to settle in and think about these new characters separately. And that can be difficult to do. When we've had time to fall in love with the British cast, it's hard to set up interest in a new set of people. The pilot didn't give me particular interest in any of them. What is probably a more realistic take in this show compared with the British series is Evan's "undercover" investigation of the anomalies without any government control. In the British pilot, scientists (Cutter, Stephen, Connor), government (Claudia, reporting to Lester), and animal experts (Abby) all met conveniently at the same time in the Forest of Dean, eventually forming the ARC together. It makes a nice story for fiction, but PNW's approach makes more realistic sense. Both ways work for a show. While I like that they took a different approach there, the plot theme of Evan and his wife is much too reminiscent of Cutter and Helen. Yes, the details are all different and Evan's wife is no Helen--but still. It's true that they organized this show so that you don't need to have watched the British series, but direct repetition is still a bad thing--especially when many of the people who have even heard of PNW are addicts to the original show, anyway. We don't want to see a repeat of the same story line. The added detail, however, of the ARC jacket (that is my spoiler-free way of putting it) piques the interest and teases for a season-long plot line. It left me ridiculously curious. And Connor's cameo--his scenes were some of the best in the episode. We love the crossover. Main point is, the pilot is a start. The pieces haven't all come together yet, but they give hope for better times ahead. My opinion, and the opinion of others, it that it takes a few episodes for Primeval: New World to really take off. I read one comment, online, stating that Chocolat is one of the few cases where the movie is better than the book. Maybe that's part of the reason why it took me so long to finally read the book. But the truth is, I don't always think Chocolat is the best movie. I like it because it's about chocolate, but it's more about a moment in time than a changing plot. I do like it--I just wouldn't put it in my top five list or anything. So does that mean that the book is absolutely terrible, or that I just have differing opinions from the person who made the comment above? Call it the latter. Chocolat by Joanne Harris does have a slow start and a medium pace throughout; you sit quietly with it while sipping chocolate and set the book down once your drink is done. Although it's just a 300 page paperback, it took me at least three weeks to finish. We already know the basic plot, so carefully taking in each sentence overrules any suspense/curiosity. Because one of its subjects is chocolate, there are some lush passages describing the sweet and bitter treats Vianne creates in her shop. Unlike the movie, there is less about cacao and more about confections--which seems more realistic to me. I always wondered how Vianne could actually make all her chocolates out of cacao beans in that little shop, as the movie implied. The whole plot line about Vianne's mother is also entirely different, as is a certain something in Vianne's character. She's more complex in the book. Most of these pages deal with the theme of warring opposites, the Dionysian and Apollinian, if you will. Or asceticism versus pleasure-seeking. Sometimes it is in characters, Vianne versus Reynaud--chocolate versus the church. But sometimes it is within one thing or person. And rather than the book pointing out the wondrousness of gorging on chocolate instead of sitting and listening to Reynaud's strict sermons, it seems, through its questions and fears of mortality, to point out the positives and negatives that exist on both sides. Vianne ponders all of life's questions through her chocolate shop. Talk about literary chocolate. Don't try and speed read through it (unless you can't help it), ponder it, and you'll find it a good book that illuminates the imagery we saw in the movie. Once the year mark passes on something I claim obsession toward, I call it an obsession more enduring than temporary insanity-interest. 1) No mad scientist at the root of all evil - The team that starts off the show is just as unaware of what anomalies are as the audience is. They aren't scientists gone wrong who created problems that they now have to fix. They're just explorers and peacekeepers of this new "problem." 2) Sci-fi that could almost as well be fantasy - There must be a reason sci-fi and fantasy often get lumped together (like at Barnes & Noble). At their cores, they share a sense of adventure, excitement, and otherness. As a generalization, sci-fi usually has more of technology and fantasy of creatures (as opposed to aliens). Primeval has technology, but it usually doesn't describe everything in detail: we're told just enough to know that there is science involved. Instead, the anomalies crop up like a force of nature and creatures from the dinosaur-like Gorgonopsid to the fantasy-like camouflage critters in Episode 3.2 show up with no warning. There is whimsy to the show that edges it closer toward the fantasy side of sci-fi. 3) Characters that matter more than the latest CG or action sequence - After Season 1, the CG on this show was usually pretty good. Maybe part of the reason for this quality was that they saved CG sequences for when needed: they didn't just sprinkle them everywhere. While there is curiosity about which creatures you'll see next, the plot revolves on the characters and what they're up to. And this is one set (or two or three sets?) of endearing characters. 4) Humor that keeps the mood buoyant and light but doesn't turn the whole thing into a joke - Let's use Connor as an example here. While he has many of the comedic lines, his character is also very important toward the plot; so he isn't the traditional comic relief/sidekick character--the comedy just happens to be one side of his character. The whole show tends to be like that. It never tips over into too much seriousness, but it's also light instead of dark. 5) Growth of almost every kind - The CG improves and evolves across the episodes. The characters don't stay stagnant, but develop in reaction to circumstances. Each season offers a new angle for the audience to consider the show through. 6) The inclusion of a time travel element without really using time travel - I wouldn't call Primeval a time travel. It's hard to even say that it includes time travel. Rarely do the characters actually step through the anomalies: usually it's just the creatures coming through to our time. So we usually don't see the "time travel" at work, just the results of it. That means it isn't so much like time travel as a jumbled timeline--or, to borrow Cutter's words, "gaps in time." 7) Britishness - As an American, I don't see how this can't be a factor. This show just felt so British, from the humor to the locations to the accents. It's all a big part of the appeal, which made it hard for me to imagine a Canadian Primeval universe. 8) Pleasing plot over practicality, as fits - This is a more random factor. The truth is, the show doesn't always follow what reality would be in a certain situation. How many times, for instance, does it seem like the secret of the anomalies must have gotten out to the public? But it's fiction, and sometimes the fictional version is more entertaining than the heavily reality-inspired version. 9) The ill-suited and/or newbie factor - Starting off the show, no one in the team was specifically trained (or even really chosen) for all the tasks they end up having to deal with. So what's fun is seeing how Lester and Claudia Brown, Cutter and Connor, Abby and Stephen all deal with situations, putting in what experience they have but also adapting and learning. 10) The nerdy factor - Maybe the fact that it's sci-fi alone achieves this. Maybe not. Maybe it's that there are dinosaurs and other creatures, or rips in time. Or maybe it's because Connor is good with computers and creating crazy new devices to help the team out. Whatever it is, everything becomes so quotable in a deliciously nerdy way. The show's a cult classic--not to everyone, but people who like the show tend to love it. So I sort of always suspected that my interest in Once Upon a Time would be a mortal thing, prey to the waves of time. And, you know, that's okay: it gave me plenty of entertainment during my last semester of college and may yet have more to spread when the third season starts up in the fall. I gave my thoughts on Season 1 already; you can read those here. It's odd to try and compare the seasons. While there are areas where it felt like the season grew with experience, there are also places where it seems like the writers were trying to stretch ideas out too thin. So there are some things that I liked more about Season 2, but others that felt better in Season 1. At certain points in Season 2, it felt that the storyline no longer revolved around fairy tale stories like before; the characters just happened to have fairy tale names. We had less of the interaction with the themes and characterization that are distinctive to the individual stories. But just when I wondered if the show had abandoned that angle, they would add something back in--like the wonderful episode "The Miller's Daughter." So I suspect that the writers and/or producers have been trying to simultaneously make space for the plot to continue after this season while also making it such that viewers wouldn't be left dangling with zero resolutions if the show hadn't been renewed. Which is sort of weird to me: once I started in on Season 1, I thought the show had a good premise, but now it seems like it isn't as flawlessly planned out as it used to seem to be. Now it's starting to feel just like any other TV show with mixed up timelines and a twisty plot. Which brings me to the spinoff that will also be starting in the fall, Once Upon a Time in Wonderland. Although I hear that there will be crossover between the two (which might turn out nice), I tend to think that it would be better to focus energies on one show and develop, expand, or change it as necessary rather than try to spread the universe out too much too soon. Maybe the spinoff will turn out to be a good decision, but I only imagine it making the Once Upon a Time franchise's success more complex and difficult to keep up. Or maybe I'm just asking too much of a show that I originally said I appreciated for providing "both diversion and thought." What works well about this show is that it is family friendly without being flat as paper, it evokes memories of fairy tales while still offering something new, and it is simply entertaining to watch while also giving you something extra to ponder between episodes. If we as the audience sometimes ponder too much, imagining that the story will turn out more complex than it actually does, then that's out fault--not the show's. And as long as Rumplestiltskin and Belle are in the story, I'll keep watching. You already know that I don't drink a lot of alcohol. But when I do, I like to approach it the same way I have learned to approach chocolate: sense by sense, detail by detail. I haven't learned all the vocabulary or gained all the expertise yet, and perhaps never will, but I still try to be methodical. What better union, then, than chocolate and wine combined? The first chocolate wine I tried, which was also from World Market, looked like chocolate milk and tasted like an infusion of a chocolate beverage with wine. This one, however, has a sleeker and more serious look. It was still around ten dollars, so it of course is not going to be a fine wine--but how much truly fine wine does the average person drink, anyway? A brown label with lacy, gold lettering sticks onto the dark green bottle. The liquid's label is "red wine with natural dark chocolate flavors." Much unlike that other chocolate wine, this version from The Chocolate Shop pours just like a sweet red wine, clear and vibrant. 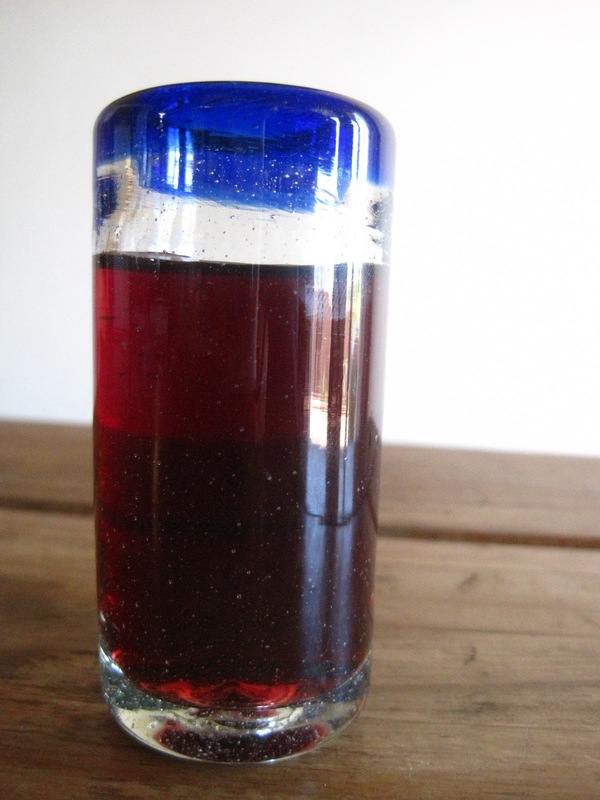 Its taste and aroma is all berries, what (if this were cacao instead of wine) would classify it as Madagascan. The chocolate flavor is, if anything, subtle--perhaps too subtle for my tastes. It's a dessert wine, though not the sweetest one I have had. Don't admonish me for it, but I find that I enjoy this wine best poured over ice. The ice melts just enough to dilute the alcohol flavor and keep the liquid cool. 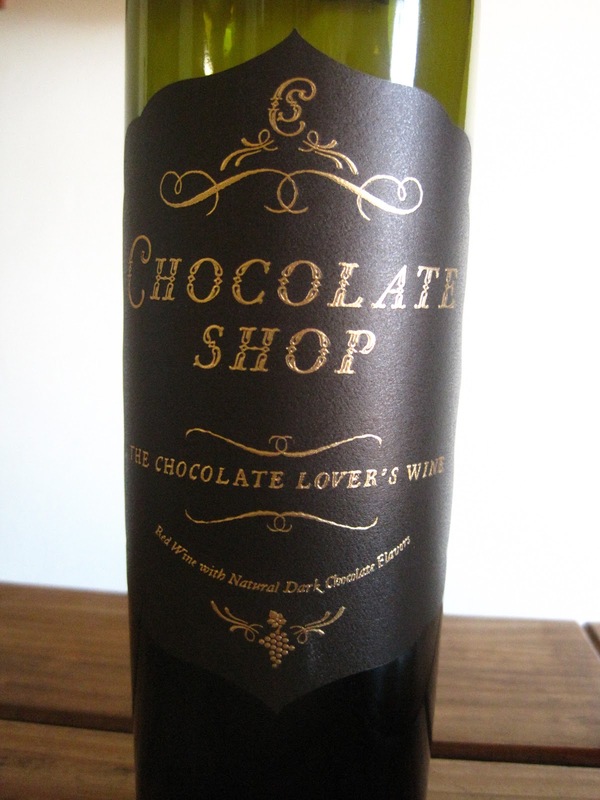 I mean, it isn't as if I chose this bottle because it was wine: it was for the chocolate. All for the chocolate. I wonder if it might pair well in dessert recipes. If Kahlua can go over cake or ice cream, why not chocolate wine? Or how about half a glass to go with flourless chocolate cake? I feel like pairing this wine with a chocolate that already has its own array of flavor notes (say, something from Amano) might be too much; perhaps try it with Ghirardelli's more simple Twilight Delight?